When your official campaign website is a brochure about you, instead of a vehicle to share and discuss our city, getting the election date right would be a good start. Or maybe when you assume that you are automatically going to get re-elected, none of this matters. Previous Post: Who delivers in the snow? Yeh, did you catch his accomplishments in “ofice”? Nan Whaleys page shows only white people, Joey Williams page only shows black, where is the diversity in this diverse city? 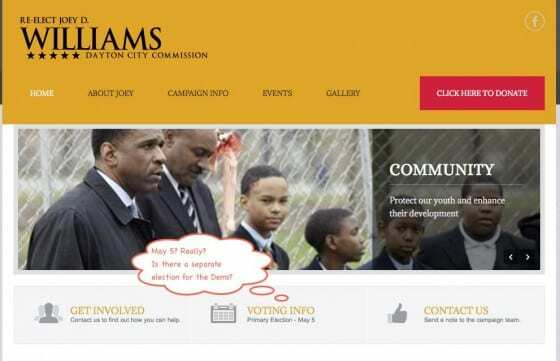 “8-year member of the Dayton Board of Education,” and yet he has typos all over his campaign website? 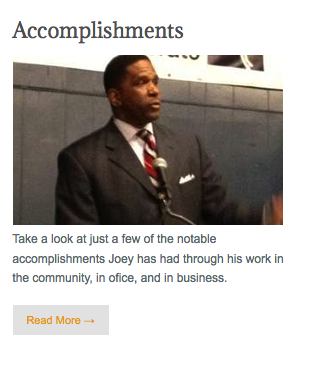 Joey’s people have fixed the misspelling of “ofice” now…. Nan’s site has (2) photos, I think, so saying she “only shows white people” is grasping. Joey’s, on the other hand, is rather disappointing. He has a gallery of only a few photos and there’s ONE white person (not counting any that might be in the background).